8 photographs, 4 cards, 3 books and 1 document. Phyllis Ricou was born in Franklin Manitoba, 1906. She later lived in Brandon, Manitoba where she was an active member of St. Mary’s Anglican Church, involved in the Ladies Auxiliary and the choir. She passed away in 1994 and is buried at the Brandon Municipal Cemetery. The collection was donated to the Daly House Museum by Phyllis Ricou of Brandon, Manitoba in 1985. The collection contains photographs, cards, books, and one document that belonged to Phyllis Ricou. The cards and books were sent from her uncle Laurie V. Smith while he served in France during the First World War. The books include The Poetical Works of John Milton, The Complete Works of William Shakespeare and A Graphic History of Modern Europe. 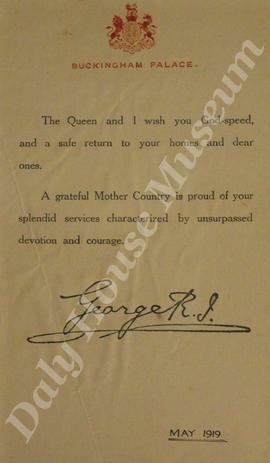 The collection also contains Laurie V. Smith’s demobilization letter signed by King George V. The photographs in the collection are of Coronation Day celebrations in Brandon, 1937. The collection also includes a scrapbook compiled by Laurence (Laurie) V. Smith between 1919 and 1936. The scrapbook contains newspaper clipping, programs and photographs of memorial services and monument unveilings at Russell, Minnedosa, Binscarth, Brandon, Birtle, Alexander, Killarney and Wawanesa, Manitoba.